That's s me breaking the surface of the water and coming up for air. Since I was asked to take down the photos that were in my previous blog entry -- as I assumed I eventually would be, I am only using pictures in this blog from ROSEWOOD that have either already been released on other blogs and websites (including the ROSEWOOD LANE website) along with some personal pictures of my own taken on the set. I will dispense with my usual apologies for being away from this blog for so long. Feast or famine with me, I guess. I am writing this to you now because ROSEWOOD LANE was locked this past weekend. What does locked mean? Basically that the film has been edited -- and those shots, now put end to end, all those takes edited together to create the story -- those edits -- are locked. They won't be changed again, and will become the finished film. The edit is broken into reels. Usually five or six. And those reels are locked. As in no more editing changes should be made. I say should because sometimes changes are made after a picture is locked, but usually, locked means locked. Locked means editing has stopped and now digital FX, sound design and mixing, the shots all color-timed by the director of photography, and the creation of an original musical score (up till now the film has had a "temp score" pieced together from bits of other film scores) begins. Daniel Ross got the wonderfully evil part of paperboy Derek Barber, and brought to it more menace and just downright creepy and scarifying stuff than I could have ever put into the script. The locked picture can now go into the final homestretch of becoming a finished picture. We have about six weeks to get all this finished. That may seem like a long time -- to do what needs to be done on a feature film, it's not. In fact, it's no time at all. Not for things as complicated as digital FX and music composition, and the looping of the film (ADR or Automatic Dialog Replacement) and all those hundreds of FX tracks, creating sound FX, adding footsteps, bird chirps, dog barks, (there are a lot of those in ROSEWOOD) every little sound you hear, all that has to come together, orchestrated by a very talented sound designer, more often times called a sound mixer, to make a movie sound like a movie sounds. I am finding myself all over the web these days, with the publicity push for ROSEWOOD. I have done more than a few interviews talking about the film, but I am hoping that people will really take notice and take an interest when the film is actually ready and will be released. 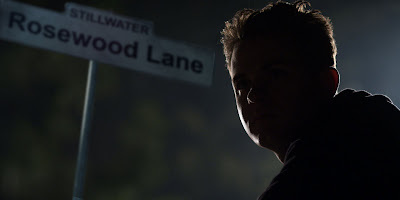 That's when we need people to notice, get curious and go see the story that takes place on ROSEWOOD LANE. Of course every interview always ends with the same question: where the H-E double-toothpicks is JEEPERS CREEPERS III: CATHEDRAL?! A poll taken on WorstPreview, showed that after four thousand of their readers were asked, The Creeper ranked the number four scariest movie monster of all time. For a fan of horror-movie monsters like me, who never dreamed he'd have have his own? That put an almost permanent smile on my face. The gorgeous Rose McGowan as Sonny Blake, trying to convince her new pet cat "Monster" to use the house's old cat door. One of the great joys of shooting ROSEWOOD LANE is of course, working with actors. And with ROSEWOOD I can't say enough how pleased I am with actor Daniel Ross Owens, and some of the delightful choices he made while playing the monster of the piece. When I say he brought more things to my "paperboy from hell" than I could have thought up in the script, I am not exaggerating. In fact, this is one of the great perks of working with someone who has great instincts (I have been very lucky in this regard, especially when it comes to young actors playing my young protagonists. Some of these great talents include Justin Long, Scott Mecholowicz, Sam Rockwell, Jason Behr and Sean Patrick Flanery to name a few, because they are willing to try things, make the part and the movie better. 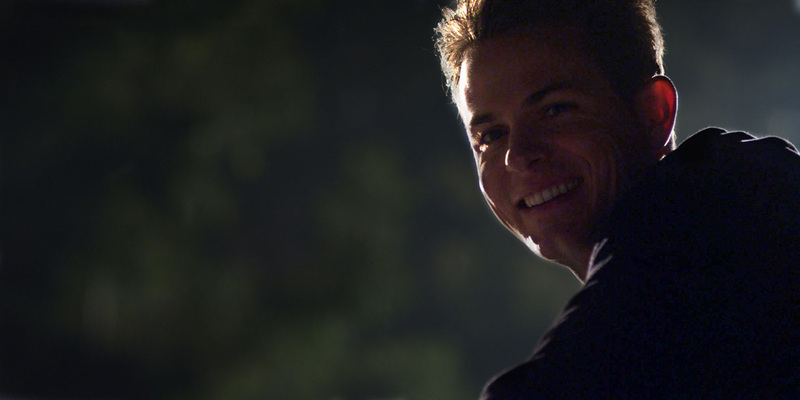 Daniel Ross Owens in a lighter moment during the shooting of the film's strange finale. HOW DO YOU LIKE THE FILM, VICTOR? I get asked this a lot -- as if I can have any real objectivity about it. It's like someone asking you, "so your kid -- do you love him?" The journey from script to screen for ROSEWOOD LANE is one that spans more than 20 years. As I have explained in previous blogs, it is strange and also wonderful to see a story I fashioned more than two decades ago, suddenly get the big screen treatment. Also, I am such a different filmmaker than I was twenty years ago, so it was also interesting to see how much of the script still spoke to me and how much I wanted to change, since my own sensibilities have changed over the years. How did all this old and new come together? What kind of thrill ride was created? Only you dear reader (and lurkers) can be the judge of that. And each of you will decide on your own how we did. 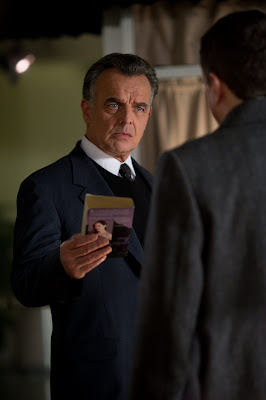 RAY WISE returns to Poho County, (or a neighboring county at least) this time as Police Detective John Briggs in ROSEWOOD LANE. The casting of Ray as the detective in the film gave me the chance to cast another of my favorite actors of all time: TOM TARANTINI of POWDER, THE NATURE OF THE BEAST, PEACEFUL WARRIOR and JEEPERS I and II. TOM TARANTINI is Ray Wise's partner Mike Sabatino in ROSEWOOD LANE. Tom and I have been friends since we met some time ago in the East Bay, before I made the big move to Hollywood land. 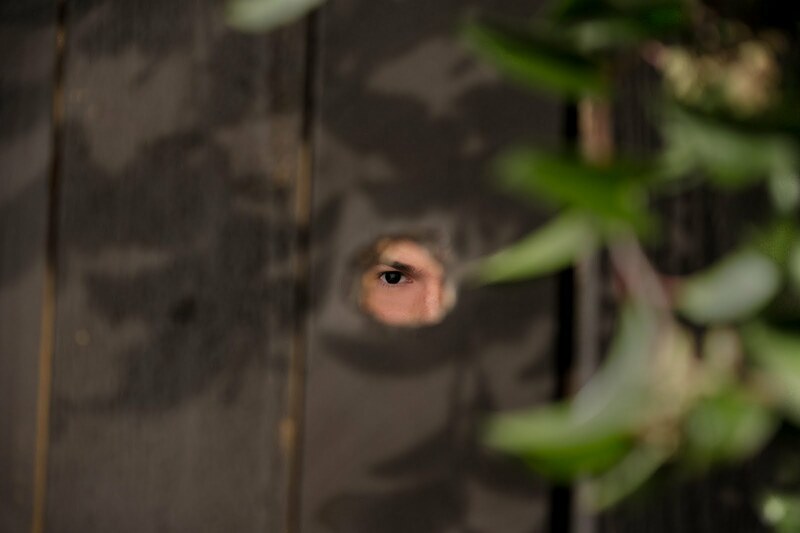 You might want to rethink all those knotholes in that fence in your backyard, after you see ROSEWOOD LANE. 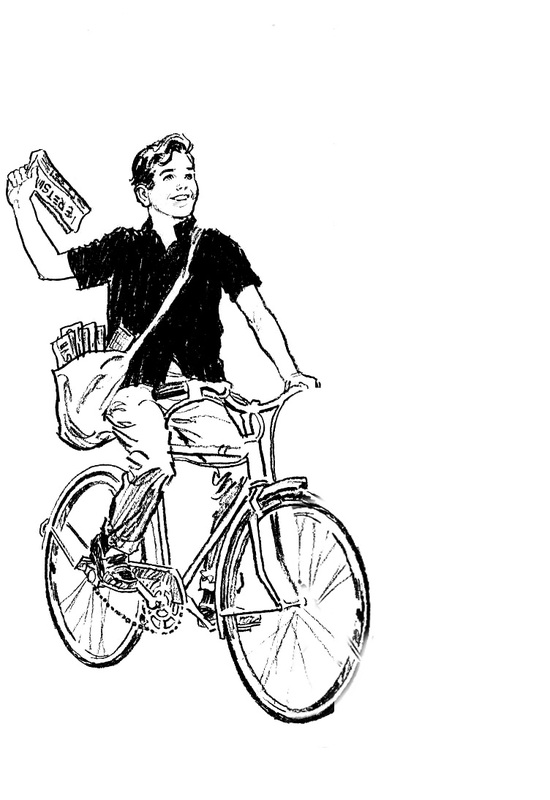 You never know what they might be used for if your paperboy is the mysterious and much feared Derek Barber. 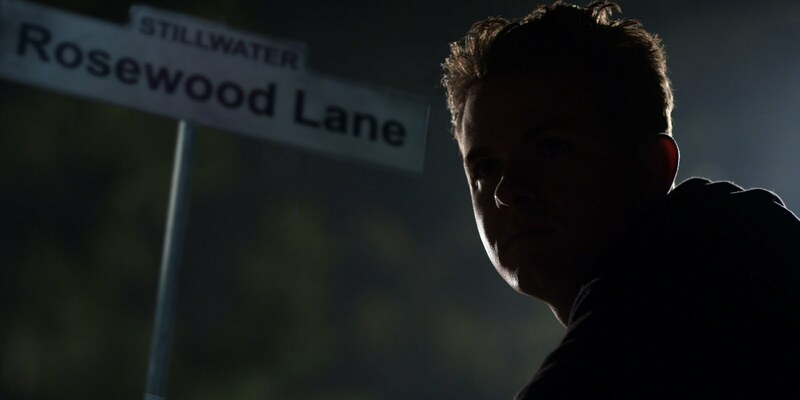 Jeepers Creepers fans will hopefully find themselves treated to something quite different but equally chilling when they learn what is terrorizing the homes on ROSEWOOD LANE. VICTOR, WILL YOUR MOVIE PLAY IN THEATERS? I get asked that a lot, especially now with a little buzz about ROSEWOOD going around. People are always shocked to find out just how little the filmmaker has to do with deciding his finished film's fate. "I don't know," I always answer, "I hope so, but there's no way of telling." While the scares are good and the cast terrific -- and the idea of taking something as iconic and all-American as the neighborhood paperboy and turning him into an unexpected nightmare is quite strong and original -- who knows the fate of my or any film in this terrible industry economy where dollars are suddenly the rarest commodity: after a good script, of course. Why do you find a great little flick in the video store or online that you can't figure out why it never made it to theaters? Because the cost of the movie is one thing. To sell a movie to the world is another. And something much more expensive than the movie. A 200 million dollar movie that you will see this summer also had another 100 million spent on it to get trailers on the TV every fifteen minutes. It's called a media buy. And every film needs one if you are going to go see it in a theater. 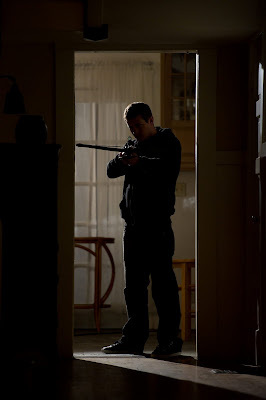 Don't let the psycho paperboy on your block trade out his bike and his morning newspapers for the crossbow you didn't know you still had in your garage. Your movie is brilliant and only cost a million dollars? Fantastic. Now you have to go find someone who is willing to put ten million MORE into advertising that film. It was hard before, to find P and A money (Prints and Advertising) for your flick. If MGM hadn't paid to put Jeepers Creepers ads on television, you might never have seen it in a theater. If Disney hadn't put POWDER ads on MTV and on all the major networks, you might never have discovered that film until one day on a dusty video shelf or late night on HBO. Each of those films cost around ten mil to make and at least that much to publicize. I also have some very late breaking news about my next film, -- or should I say my next horror adventure, for I am about to kick off my first monster movie extravaganza since JEEPERS CREEPERS darkened movies screens back in 2001. What you will know him as, is THE RATTLEMAN, and he will have a comic book incarnation as well as a movie identity -- starting with the first in a series of films that I hope will scare the living daylights out of you. 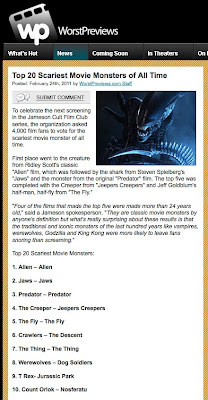 If ROSEWOOD LANE is a great example of how I was thinking about scaring people when I first came to Hollywood, THE RATTLEMAN is about how I play the scare game now, with the benefit of having made the Jeepers series and seen so many brilliant contributions to the genre by my horror brothers and sisters throughout the last decade and into the new millenium. Though I am rather superstitious about announcing things before the ink is dry on the paper, THE RATTLEMAN may be starring Ray Wise and a few other talented veterans of my previous films. Including the multi-talented Doug Jones as the title role -- or should I say, the title nightmare in THE RATTLEMAN. Only time will tell, as negotiations begin with my friend Doug -- and many others of my Jeepers family, to bring my next horror odyssey. I am planning on at least five Rattleman films before the new decade is over, and I am making them specifically for me, and all the horror fans, from all over the world, who I have heard from who tell me they enjoy they way I tell a tale. 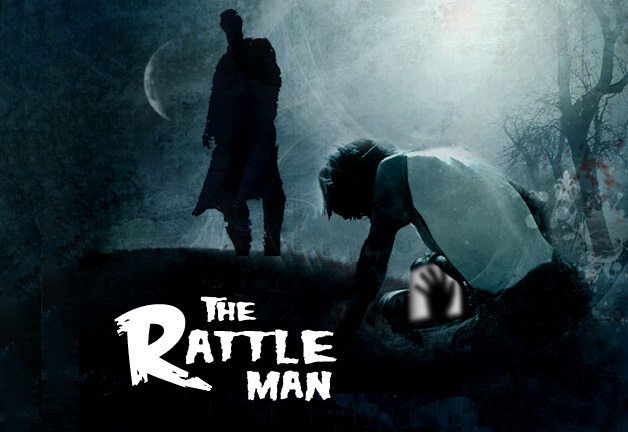 A piece of concept art compositing different images to create a single visual idea of what THE RATTLEMAN is about. As I have said before, these are images that are amalgams of images collected from all over as I write my first draft of any script. Writing to art, like writing to music focuses me on the story, the characters, the set pieces or whatever I am trying to get down on paper. None of the images I composite are being used commercially or for profit, just for my own private and personal writing process, so I feel free to use whatever terrific images I find (even ones from other films) as long as they feed my excitement about the script I am creating. But I digress. More facts about THE RATTLEMAN as they become actual facts. Be well everyone. And thanks for taking the time to write me. I know I am slow at answering sometimes, but it is great to hear from you and to be reminded that the blog does in fact reach a few folks out there in the world.